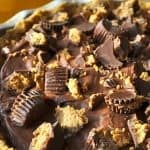 Mmmmmm Nutter Butter crust, chocolate pudding, and whipped cream mixed with peanut butter cups and topped with more Reese’s Peanut Butter Cup come together to make this Reese’s Peanut Butter Cup Pie. A pie worthy of making ONCE a year only because really it’s so rich! This is one of those once a year kind of recipes, as in I would only trot this out once a year for a special treat because I’m pretty you shouldn’t eat a lot of instant pudding and nutter butters. This year I made it for my husband, his birthday is the day before my son’s birthday, which is two days before Valentines Day, which means I’m always crunched for time and this pie is super easy. Especially with getting presents shopped for, presents wrapped, parties planned, all applicable valentines made and signed and yeah by the time the birthdays hit I’m exhausted. Yep totally overly processed but also super easy, a time saver and a mind blower. Looks so good! I love peanut butter and chocolate together. Can't beat an easy dessert like this! Looks awesome! And here's holiday fun for you: December: a birthday on the 18th, followed by Christmas Eve and Christmas Day (2 separate celebrations) and a birthday on the 29th. Then I sleep for 2 or 3 days. Happy Valentine's Day to you, and happy belated birthdays to your guys.